Ballbot offers a unique robot design for mobility; it can move in any direction easily because it balances on a single ball that rotates in any direction. Ballbot is the creation of Carnegie Mellon University robotics Professor and inventor Ralph Hollis, who started working on it at home and then attracted funding from the National Science Foundation. "We wanted to create a robot that can maneuver easily and is tall enough to look you in the eye," Hollis said. 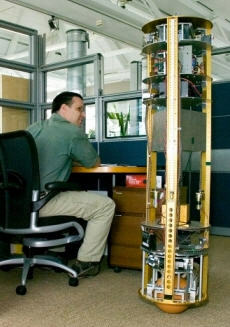 "Ballbot is tall and skinny, with a much higher center of gravity than traditional wheeled robots. Because it is omnidirectional, it can move easily in any direction without having to turn first." Ballbot's onboard computer gathers data relevant to balance from its sensors and adjusts the ball accordingly. Science fiction enthusiasts should be able to remember a robot that moves on a single ball unipod foundation. Unfortunately, I can't! Reader comments are encouraged. 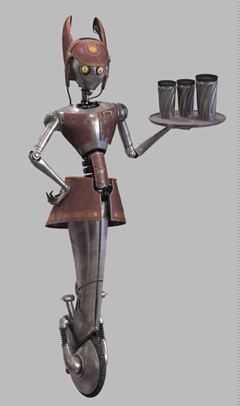 The closest I can get is the single wheel robot WA-7, the robotic waitress from Dex's Diner in Star Wars II Attack of the Clones. As you can see, WA-7 moves on a cross-section of a sphere, which is close.